25 lakhs, and a loan term for 20 years. Principal to be paid up in 2/3 of loan term in installements, followed by interest payment in the next 1/3 term of loan period. Interest rate is 8.5% p.a. Such a scheme existed for Bank employees. But now that is getting extended to all central government employees. Is this a simple plan to share the benefits of De.Mo to a large group of people? Central Govt. employee strength is huge, and they are every where in the country. One reason why DeMo was done was to cripple FICN networks. The networks continue to operate, however. Its important that the 2k note and later on, the 500 note too be slowly done away with. Let all large txns happen digitally only. Deans Sir, if Indirect taxes continue to grow in this manner, direct taxes can definitely be reduced. Just a few years ago, the ratio was 70:30, and it has steadily reached a point where indirect taxes are now more than direct tax collections. In a decade, hopefully local taxes will completely overshadow income tax and allow more folks to report their true incomes while enjoying lower tax slabs due to the wider base. Of course, Direct includes Corporate taxes, which hopefully won't go down. PC basically undid what Pranob had managed quite well. the Ratio is 67% Direct & 33 % indirect tax. base (whch DeMo and GST should do), taxing rich people masquerading as farmers, Taxing people in the North East, taxing dividend above a certain level and plugging tax dodges on capital gains. govt employees, ex servicemen etc). what is the quality of these fake notes? that's something I don't see being reported. We know that the old notes had fakes so good that even banks struggled. what about these ones? how many features can they fake and what is not faked? These are important to know. In India, direct taxes are only punishment for people who deal with white money and black money dealing fellows pay nothing. This "progressive" direct taxation is not going to work in a globalised economy. As far as poor paying more tax our GST takes care of that by ensuring that there is almost Nil or smaller tax on the goods etc used by poor. The key of the message is the assumption that all government subsidies (based on Aadhaar) are routed to the bank account which they have last seeded with Aadhaar #. The major mobile phone service providers have also started their "payment bank" schemes, and after the Aadhaar linking of a mobile phone, the mobile phone companies are opening a payment bank account, without checking with the customer (by some sort of trickery/forgery). The subsidy amount all goes to the payment bank account. The mobile phone company charges a hefty penalty for closing such accounts, and makes it pretty impossible to transfer money out of this account. I don't know whom to believe here. Way back in 2000s, when Credit Cards were just becoming more popular I used to get credit cards from some banks even without asking/formally requesting. One bank even said that, since I had a saving bank account with them (my salary account), they "assumed" that I may also like to have a credit card. Added later: Ba$$$rds at AirTel indeed did seem to come up with such a cheap scheme. v. I authorize the Bank to use information which is KYC documents , particulars provided and usage based relationship information, for Account opening purpose. I authorize the Bank to link my Bank Account with Aadhaar number for electronic transfer of subsidies. Related entities and further solemnly authorize Bank to use or share my documents and/or information provided for provision of third party products. Airtel ironically chased me to provide the KYC docs for a record third time. I escalated all the way up to their Ombudsman, but no one gives a ***. I realize most cos in India are lala companies. Mentality and mindsets arise from this background, regardless of the region or language or religion. Probably something we need to watch out for, especially anything to do with Airtel. But here, the T&C's shown are for the payment bank and it seems to make sense to have the bolded statement in general, same as for any regular bank. I would think a customer having accounts in multiple banks will have to choose which account receives with subsidy. There is nothing here that shows that the amount will randomly get routed to any account and in this case Airtel due to providing the mobile service will somehow force it to its own payments bank account. Heck, most people will never open an Airtel bank account knowing their reputation! How would they do this trick for them? Am I missing something? Marten wrote: I realize most cos in India are lala companies. Mentality and mindsets arise from this background, regardless of the region or language or religion. Add to this, the dress code and the general sophistication. A "suit booted Lala who speaks English"; is also very same to the Lala-ji of the old days, waiting to pinch money from others. The assumption (in the stories I heard) is that the subsidy generally lands up in the last bank account which got linked up with Aadhaar. I also did some basic search to check on the veracity of this story. The sad truth is that; AirTel did use such a dirty scheme. What it did was to start Payment bank accounts from customers, without getting their "informed consent". That is they may have made their customers concent for the payment bank account to be created, without clearly telling what that meant. Many mobile users in India are still illiterate or semi-literate, and may give a "YES" to any thing without actually asking questions. UIDAI slaps notice on Airtel, its payments bank for flouting Aadhaar rules (Sep 21,2017). LPG subsidy was not credited to Airtel Payments Bank accounts: Oil Ministry (Oct 27, 2017). Note, this report talks diamterically the opposite in the article; i.e subsidy was deposited in Airtel Payment bank accounts. That is absurd. This is how license raj came into being - post a gobirmant inspector at every nook & corner to catch evil Hindu baniya evading taxes. Where did that land us? If a shopkeeper is jacking up prices it is because he wants to have the same profit as he made earlier, perhaps without tax. If earlier he charged X amount to make Y profit, now he will charge X+18% to make the same profit. Why would he shell out the 18% out of his own pocket? If the consumer doesn't like it, he can go to another shopkeeper who can provide the same stuff cheaper. Pure market economics. No body is asking them to pay the 18 %. At least in Chennai the issue is that majority of the restaurants are charging GST on top of the earlier MRP which already included tax. How does their cost go up if they can claim input tax credit and everyone is doing the same thing and formed a cartel through their association. In fact some of them were distributing pamplets stating that Govt is charging low for alcohol and high for food and asking us to take it up with Govt. The reality is that alcohol is excempted from GST. How do you handle this practice? Still lot of them are offering stuff without gst as well if u pay cash and dont ask for bill. The crucial 'What India can do about it' part was shallow, IMHO. Pointing out specific instances of non-tariff barriers used by the Far east in the past and how Delhi could replicate the same would be so much more concrete and useful, methinks. Still, worth a read and fwd, perhaps. There are 9.5 lakh Unsold , completed Flats lying vacant right now in the country. After Linking with Aadhaar ,Govt is planning to tax the Unsold properties @ 5-8% which has got CC. 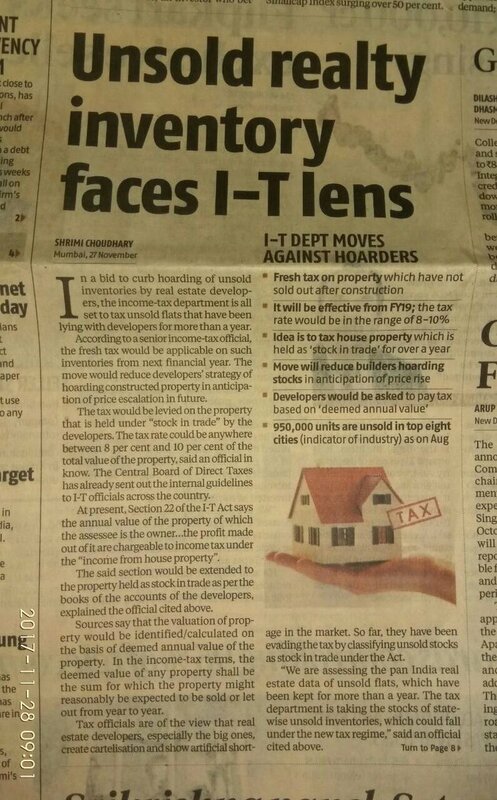 This will compel property hoarders to sell in open market bringing relief to genuine Home buyers. What he doesn't mention is that the provision is aimed at developers/builders mainly. This is a stupid proposal and probably a rumor, builders will always try to liquidate assets, no need for this. Even nominally stable property rates means that over a period of time property will become more affordable. No need for Govt to interfere in this. i see hoardings all over ORR saying 0 EMI until possession and other freebies. builders are focussing on completing projects than launching new ones...these are the bigger ones. % increase = 2.84% oi.e. below 3% !! After googling on "china electricity consumption increase" , I found that (see http://www.chinadaily.com.cn/business/2 ... 644546.htm ) china's consumption in june-2017 increased by 6.5% and 9% in kuly-2017 . Now I wont trust chinese numbels that too coming from Chinese Daily. But 3% growth in India is low by any standard. And efficiency increase imo doesnt justify it. And to that, add the fact that GST collection of oct-2017 went down by some 8% !! And that was NOT due to decrease in GST rates. Because decrease in GST rates came in oct / nov, and that would get reflected in nov / dec collection numbers and not in oct-2017 numbers. So only conclusion I draw is --- economy is in ICU. And we voters better do something about it. Now what can be done is .... well outside the scope of this thread and outside the scope of this forum etc etc. Sri Modiji has decided not to tax vast empty plots, but do tax finished flats. So builders will now decide to keep plots empty and start building at much slower pace. And caveat is - finished flats will be taxed and unfinished flats wont be taxed !! So now what is going to stop builders from keeping flats 1% unfinished, and thus escape taxation? And income tax officer incharge of deciding, whether the flat was finished or not, and thus taxable or not, can also collect some bribes. Gotta love Sri Modiji's ideas !!! Congress people look pygmies. Centre May Allow Banks To Use Your Hard-Earned Deposits In Case It Collapses. Scary Bail-in clause in FRDI Bill cleared by the Union Cabinet in June 2017 allows banks to finance themselves using depositors money. Preparing For Cyprus Moment: Centre May Allow Banks To Use Your Hard-Earned Deposits In Case It Collapses. Scary Bail-in clause in FRDI Bill cleared by the Union Cabinet in June 2017 allows banks to finance themselves using depositors money. Priding themselves for being 'cash-less' post demonetization last year, some Indians may come face to face with a horrific post-apocalyptic future where they could be deposit-less too. Yes, this could be a reality unless the government of the day removes the unholy 'bail-in' clause that theoretically allows beleaguered banks and financial institutions to legally usurp depositors' money in a desperate bid to stop going bust. What will happen if one day you find your hard-earned money just disappear forever? We live in times when bank deposits are the gold standard of safety, but that sheen can quickly fade away. Recently, the Indian government gave the banking system a $32 billion shot in the arm. The massive recapitalization scheme was required because some state-run banks are loaded with mountains of dodgy loans. Estimates show 10-12% of all loans made in India have turned bad, or as they say in banking parlance, have become 'non-performing'. What will happen if another crisis hits the banking system? The answer to this question depends on The Financial Resolution and Deposit Insurance (FRDI) Bill, 2017. If this bill goes through in its current form, some of you as depositors may end up financing the next multi-billion shot in the arm the Indian banks would require the next time, and the next time, and the next time. The FRDI Bill was cleared by the Union Cabinet cleared in June 2017. Last heard, the bill was under the consideration of a parliamentary committee. While the bill when it becomes a law will lead to the birth of a Resolution Corporation which will exercise control over banks, insurance companies, and other financial institutions, it contains the hair-raising 'bail-in' clause that has serious consequences for even common depositors. You may have heard about 'bail-out', where an individual, entity or the government gives money to a failing business to prevent it from going kaput. A 'bail-in' is exactly the opposite, which involves rescuing a financial institution on the brink of failure by making its creditors and depositors take a loss on their holdings. In banking terms, depositors are considered unsecured creditors since no depositor seeks security from banks to keep the money. While a bail-out involves money of external parties, a bail-in signifies funds taken from internal stakeholders. In the Indian context, a bail-in could see depositors losing the control of their deposits in case a bank’s financial situation deteriorates so much. Though it's hard for people to believe any government anywhere would ever let that happen, it's happened before. In 2013, bank depositors in the small European country of Cyprus lost millions as their savings were seized to cover bank losses. In the last 2-3 years, different countries have implemented legislation that would allow them to first freeze bank assets during the next crisis. These moves are all about stopping people from moving their capital into actual physical cash. But a 'bail-in' takes this to a different level altogether. Trade unions, banking experts, and political parties have opposed this clause. Against this backdrop, Finance Minister Arun Jaitley has sought to allay fears about the 'bail-in' clause in the FRDI Bill, but the bigger question is why was such a clause inserted in the first place. Are depositors to blame for the non-performing loan mess Indian banks find themselves mired in with amazing regularity? The unequivocal answer is no. Without depositors, banks could never have lent in the first place. The mess is because of the bank and the borrowers. Depositors are sacred, and so is their trust. Though many would like to say that the 'bail-in' clause is just meant as a last measure or emergency capital for banks, the surreptitious sneaking in of a measure to execute hair-cuts on depositors' money. The bail-in clause in its current form gives the power to convert any securities from one class to another, including the creation of a new security in the modification of an existing security. This may mean that deposits may be converted to shares. This means your deposits can be converted into equity in order to recapitalize and bail out banks that are facing bankruptcy. Even depositors, who had to undertake hardships to lay their hands on their own money during the 2016 bank-note demonetization, will find it is incredible that the government wants to appropriate their hard-earned savings to bail out useless banks. This 'robbing Peter to pay Paul' is wrong on so many levels. Any such sly move hits and takes away the indirect safety and guarantee of deposits that we Indians come to associate with banks. No government in its right mind should dare to do this unless they actually want depositors to move away from bank FDs! I support bail-in in PRIVATE banks , and private banks ONLY. I oppose bailin on PSU banks. And PSU bank should support zero percent 100% (CRR + SLR) accounts where interest wil be equal to interest on GoI bonds only. And all fees should be made explicit including fraud protection fees, chequing etc. PSU banks should stop lending money to private parties except select INDIVIDUAL borrowers like 1 home, medical, education, personal vehicle, 1 commercial vehicle per person etc. There are some very low risk loans and PSU banks should confine to that ONLY. Lets see what detailed guideline NaMo prints for bailin. Many describe bailin as a revolutionary reform which does emancipation and empowerment of bank owners. The bankers will empowered to say "you wont get interest" and bankers will be emancipated and will be allowed say "heck, you wont even get 100% deposit back" !! Liberation, emancipation, empowerment, revolutionary, reforms ... wow !!! That's just a one month snapshot of production, but actual supply is different. CSO reports that electricity IIP increased 6.1% in last quarter compared to 3.1% the corresponding quarter in 2016. See Page 3 & 4, para. 5.4. It seems to me that some people here HAVE to rain on every post by anyone else, they only see their own vision (blinkered enough though it may be) for India's future. Very much like AAP supporters in the past who did not like the Congis but hated the BJP even more, believing in their own messiah - - oblivious to all the evidence against their own arguments. Sigh..... I thought things would be different in this new avatar, but it is the same old sour wine in the same old bottle. If the banks tighten up, as many as 6 of India’s top 10 business houses will fold up. HYDERABAD: The TV channels are once again going to town over Vijay Mallya's extradition hearings in a London Court. By turning the heat on one of the smaller of the big defaulters, I suspect that the regime is only trying to take the spotlight off the gigantic NPA's of Essar, Reliance ADAG, Adani, GMR, GVK and others. Lets get something right about Vijay Mallya. The popular narrative is that he milked the banks for Rs.9000 crores to support his hedonistic lifestyle in India and abroad, and took off when the debt burden became excessive or no more money was forthcoming to evergreen his debts. But we seem to forget that he enjoyed a hedonistic lifestyle much before Kingfisher Airlines and he had much money to spread around even before Kingfisher Airlines. He had even taken much of his money abroad well before Kingfisher became an airline rather than just beer. He lavished money on the Janata Dal’s of Ramakrishna Hegde and Deve Gowda, the BJP of Atal Bihari Vajpayee and LK Advani much before Kingfisher Airlines. The BJP itself, that is the party and its MLA’s, took over Rs.100 crores from him for his two Rajya Sabha elections, and the Deve Gowda rump of the Janata Dal probably more. The Congress never allotted him votes, surplus or otherwise, but it does not mean that the Congress and other parties did not benefit from Mallya. And then lets not forget MJ Akbar, who helped himself as only he can. The Rs.9000 crores he is now found owing to the PSU Banks and others is the money he lost on Kingfisher Airlines. I understand the loan money is about Rs.4000 crores and the rest is interest and the interest on interest. The banks just kept lending him money to evergreen its loans. This was not possible without political and bureaucratic support. Even if one little Joint Secretary or one little MP or one little bank manager red flagged the growing stain of red on Kingfisher Airlines debts, the bleeding would have been staunched. Mallya just did not milk the banks to keep Kingfisher Airlines afloat; he milked his own companies such as United Breweries and United Spirits to support its flight into the deep red. All during this period, Kingfisher Airlines did not sell enough seats to cover the costs, or just spent more money than it earned. The question then is why was Mallya lent money when quite clearly Kingfisher Airlines increasingly showed it had a business model that precluded it from earning money. Let us not forget that during this period Air India and Indian Airlines together lost Rs. 43,000 crores. The money lost under Mallya’s stewardship was a measly Rs.4000 crores. But we are not putting out Anant Kumar, Sharad Yadav, Praful Patel and Ajit Singh out to dry for its losses. Why? In the entire hullabaloo over Mallya’s last flight to the cooler and more salubrious climes of Hertfordshire we are forgetting the bankers who lent Kingfisher Airlines for something quite as spurious as its brand name. Such loans are sanctioned when everybody gets to drink a little at the trough. Now Mallya has flown the coop that nurtured him, and it seems that all others stand absolved. And who was the senior minister who is suspected of tipping him off to flee. Forget Mallya. He won’t be coming back soon. The banks can attach his cars and homes in India, but he is clearly out of reach of the “authorities” that don't really want him back. They probably don't even want him to live for too long and long for him to take his secrets to his grave. He just turned sixty, but his corpulence looks unhealthy. Mallya being a betting man would not probably bet on his own longevity. Anil Agarwal and the two Ruia brothers, Shashi and Ravi, are now bigger abroad than in India. Not very long ago Nitin Gadkari was cruising on the Essar yatch berthed at Cannes. Our “industrialists” all use their company assets for personal pleasure. Company jets and lavish company homes are meant only for personal use and for the pleasure of others. Money is routinely extracted from corporate coffers not only for their girl friends and mistresses, but also for their prostitutes in government and politics. Money flows from our business houses to the full political spectrum including groups like Naxalites in Bastar and ULFA in Assam. The not too industrious "industrialists", most of who make most of their money from the PSU banks, also fund the hedonistic political lifestyle of our elite. Why is the RBI not blowing its whistle to stop this? Why is the Department of Company Affairs so silent? One can understand Arun Jaitley acquiescing to this, but what keeps the RBI from reading the riot act to the banks? The problem is that we are far too invested in this system. If the banks tighten up, as many as six of our top ten business houses will fold up or will have to be dismantled. In other words really restructured. Except for Reliance Industries, Tata’s and Aditya Birla, all other major business houses are over leveraged and mortally indebted. If we rock the boats now, many will capsize. The economy will further slowdown. Mallya is relatively small fish. The big sharks are still circling the banks. Anil Ambani, Gautam Adani, GMR and GVK, Lanco are all well known big fish. Will the Prime Minster please stand up in Parliament and assure the nation that all the moneys lent to them are as per norms and prudential banking practices, and that the loans are not being ever greened? Will Rahul Gandhi demand that the PM gives the nation an assurance on this? I don't think so. Both are betting on short public memories. We love gladiatorial sports and the Roman emperors best understood mass psychology. We have plenty of pilgrims to feed the lions and the public’s frenzy. 52. (1) Notwithstanding anything contained in section 49, any action taken by the Corporation pursuant to this section may be through a bail-in instrument or a scheme under section 48 the form and manner of which shall be specified. (b) a provision for the purposes of, or in connection with, any bail-in provision made by that or another instrument. (c) a provision that a contract or agreement under which a covered service provider has a liability is to have effect as if a specified right had been exercised under it. (4) (a) for the purposes of clause (a) of sub-section (3) of this section cancelling a liability owed by the covered service provider includes cancelling a contract under which the covered service provider has a liability. (i) modifying a liability owed by covered service provider includes modifying the terms or the effect of the terms of a contract under which the covered service provider has a liability. (c) creating a new security, of any form or class, in connection with the modification of such an instrument. (5) The Corporation may specify the liabilities, or classes of liabilities of a covered service provider, which may be subject to bail-in. (b) direct the issuance of equity to the creditors. Explanation: For the purpose of this section, haircut shall have the same meaning as assigned to it in section 45 of this Act. (h) such other liabilities as may be specified by the Appropriate Regulator in consultation with the Corporation and the Central Government. (c) if the bail-in instrument deviates from the requirements of section (3), then the reasons for such deviation. (9) A copy of the report received under sub-section (8) shall be, as soon as may be after it is received by the Central Government, be laid before each House of Parliament. (10) The provisions of sub-sections (3), and (6) of section 49 shall apply to this section mutatis mutandis. Explanation I: In this section, “client assets” shall have such meaning as may be specified. Explanation II: The purpose of bail-in is to absorb the losses incurred, or reasonably expected to be incurred, by the covered service provider and to provide a measure of capital for it so as to enable it to carry on business for a reasonable period and maintain market confidence in it. Existing law says --- if bank cant pay even one deposit in full, then bank must declare bankruptcy and then yes, depositors may loose money above Rs 1 lakh. The existing law covers only Rs 1 lakh, but GoI had given an IMPLICIT unspoken promise that 100% money in PSU bank is safe. And people have been taking this implicit unspoken promise as something written in stone. The new PROPOSED law says --- Financial Resolution Corporation can cut away portion of deposits above insured money, and bank will NOT need to declare bankruptcy. So bank can simply pass losses to depositors by cutting away their deposits - interest or principal or both. And bank can be in business. So by passing this law- now Govt is making a clear statement that 100% of your money in PSU bank may not be safe anymore. Also, today, if PSU bank has to declare bankruptcy, then Cabinet has to pass resolution and may even require permission of Parliament. So today, PSU banks' depositors cant be asked to take a haircut without explicit resolution in cabinet ministers and also Parliament. So the event of deposit loss would fetch huge public attenstion. But the new law says --- Financial resolution Corporation can haircut deposits. This corporation will need no permission fro cabinet or Parliament. So depositors can be asked to take loss, and the even wont fetch much public attenstion. So imo fear against bailin is REAL - not some hoax. FD owners may loose part of their FD if bank looses. Rest - each one can cite his opinion. But - there is NO sentence in the law that "Govt will protect all PSU banks' deposits".